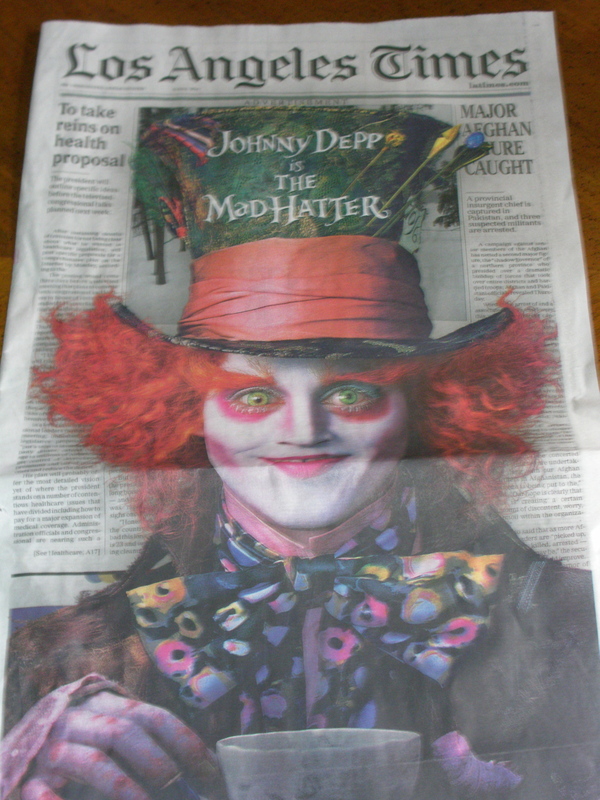 On Friday, Los Angeles Times subscribers found this splashed across the front page: a full page advertisement for the new Johnny Depp/Tim Burton film, Alice In Wonderland, featuring a heavily coiffed and made-up Depp as the Mad Hatter. Except this wasn’t the real front page. The ad was wrapped around the actual newspaper. Looking at today’s letters to the editor page commenting on the stunt, some readers were not amused. The Times, whose parent Tribune Co. filed for bankruptcy in 2008, has gotten in hot water before over aggressive strategies to raise money. In 1999, a scandal broke out over a profit sharing agreement the newspaper made with the Staples Center sports arena. The incident elicited anger from newspaper staff and readers alike. In April 2009, the paper published a faux front page column about a day in the life of a rookie Los Angeles Police Department officer. The “column” was a promotion for the then-NBC show Southland. Critics said the stunt damaged the newspaper’s credibility, going beyond what is ethically permissive. The newspaper’s executive editor said later that the Southland ad was a mistake. The Alice In Wonderland ad may get fresh criticism, and might cost the troubled newspaper more subscribers. But with the newspaper industry nearing financial collapse, will readers just have to get used to these sorts of creative – and journalistically questionable – ways for news publications to raise money? Or, if we don’t like this cozier relationship between editorial and advertisers, then the only other way to save the newspaper industry might have to be more government involvement and investment. ← Citizen journalism video: On A Bike, Reinventing L.A.